Zoo Girl has no family. In the children's home, she feels lost and alone. On a trip to the zoo, she is accidentally left behind. But the animals love her... and when the keepers find her snuggled in a cage they know they have found a daughter at last. This is a strikingly illustrated picture story - written with just one or two words a page - with values of family, love, belonging and cheer at its heart. - Publisher A strikingly illustrated story with a heartwarming message about family, love, belonging, and home at its heart Zoo girl has no family. In the children's home, she feels lost and alone. On a trip to the zoo, she is accidentally left behind. But the animals love her--and when she's discovered snuggled in a cage with the tigers by the zoo keepers and brought back to the orphanage, she doesn't want to go. Thankfully, the keepers know when they first see her that they have found a daughter at last, and return shortly with adoption papers to take her home with them. Zoo girl has found her family at last Written with just one or two words a page, this simple tale about finding one's place in life is sure to resonate with children everywhere. 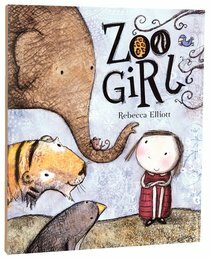 A strikingly illustrated story with a heartwarming message about family, love, belonging, and home at its heart Zoo girl has no family. In the children's home, she feels lost and alone. On a trip to the zoo, she is accidentally left behind. But the animals love her--and when she's discovered snuggled in a cage with the tigers by the zoo keepers and brought back to the orphanage, she doesn't want to go. Thankfully, the keepers know when they first see her that they have found a daughter at last, and return shortly with adoption papers to take her home with them. Zoo girl has found her family at last Written with just one or two words a page, this simple tale about finding one's place in life is sure to resonate with children everywhere.